15. Wu-Tang Clan – C.R.E.A.M. The vast majority of these tunes will be well known by the majority of you but I want to give a special mention to a couple of cuts here. Miilkbone held an affiliation with Naughty By Nature and ‘Keep It Real’ is a quality example of how well piano samples can be used. With a tasty horn loop and tight snares as well this is a demonstration of how strong Jersey’s contribution to hip hop has been. World Renown’s ‘How Nice I Am’ is off their shelved LP and was produced by the mighty K-Def. I first heard it at K-Def’s website which is nicely put together with a full discography and some videos to check out as well; peep it at http://www.kdef.biz. As an aside, if anyone has this album in its entirety then please let me know. Finally, although it is probably one of the most well known tunes on this compilation, ‘Up Against Tha Wall’ ranks as one of my favourite Premier beats of all time. Back in my less knowledgable days it took me ages to find out what it was after hearing it played in the warm up session of a Souls Of Mischief gig. I was elated when I finally got a hold of it and even the undeniably wack rapping can’t take away from the quality of the beat. The idea for the compilation came from an idea I had back in my DJing days when I thought it would be cool to make a mix that was linked thematically by instrument. This is a concept I plan to continue in the future so stay tuned over the coming weeks. I am not usually that up on the original sources for samples as often I find myself disappointed by the tunes in their entirety. There is an interest as a result of their usage in a hip hop context but it doesn’t usually go beyond that. 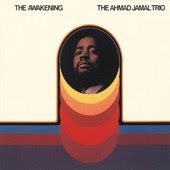 However, Ahmad Jamal’s album is not only the the root of both ‘Resurrection’ and ‘The World Is Yours’ along with a selection of other hip hop tracks, but is also a beautiful jazz album that is worth a listen beyond geeky sample spotting (no hating intended). Jamal was one of Miles Davis’ favourite pianists, and his style is subtle yet highly engaging. Check this recording of the the trio in 1959 and imagine yourself in a dimly lit and smokey club with a drink in one hand and cigarette in the other. These old jazz cats had style and grace by the pound. The track ‘Awakening’ also features the break utilised by Da Beatminerz on the track ‘Change’ by Shadez of Brooklyn. If you have the 12” then please drop me a line. I wanted to include it in the mix but don’t own it: help me out people! As far as equipment related to hip hop, there aren’t many pieces of technology that are as essential as the Technics turntable. Originally manuactured in 1972, these tables have been through several incarnations with the addition of a couple of gimmicky features but basically these industry standard decks have remained the same for over 30 years. Although there are now equally capable turntables out there, particularly the Vestax range as well as the more recent Numark models, no other deck has the appeal of the Technics for me. The design is classic and the durability is untouchable. It could be suggested that the development of scratching and juggling techniques would have been significantly delayed if it wasn’t for these babies: if you own some then you know what I’m talking about. In fact, just writing about them brings me back to my torn attitude towards vinyl whereby I would love to own a massive collection but don’t have the finances to support the addiction. Who knows, maybe in the future I will return to the format but for the moment I am a CD man. I will be throwing up a few more posts on equipment essential to the genre so once again, keep checkin’ into FDB. Enjoy the weekend folks.